I was in the final stretch of making Sunday lunch for my uncle and favorite cooking aunt, debating where I should buy a jar of dulce de leche to add to the polovorones or shortbread cookies I’d made earlier. The gourmet shops nearby carry the good but expensive La Salamandra while the Colombian stores have a wider selection but seemed too far away in Queens. I decided to make my own instead. Though I knew it was easily done at home, I’d always avoided it in the past. Worried about exploding cans, we’d take them off heat too early and end up with milky mustard instead of a deep caramel (though it was still happily eaten). I found these recipes on From Argentina With Love for making dulce de leche at home that skipped the treacherous can boiling. Unwilling to face yet another grocery store run to buy whole milk, I tried the second version where a can of condensed milk is cooked in the top of a double boiler over a pan half filled with water. Though it takes 2 to 2 1/2 hours, it only needs to be checked and stirred about every 45 minutes freeing me up to work on other things. Because I’d rolled the polvorones thinner than usual, I watched the cookies closely and shortened the baking time to 10 minutes. I let the dulce de leche cook the entire time for a thicker consistency. Too rich to spread, it was the right consistency for holding together the crumbly cookies. A painless last minute (+two hour) solution. 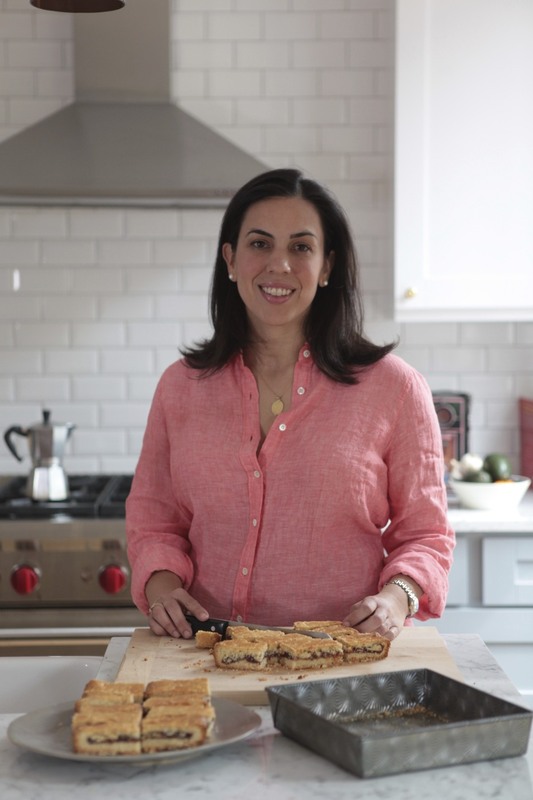 This is my favorite shortbread recipe adapted from A Taste of Old Cuba by Maria Josefa Lluria de O’Higgins. Beat together butter with the 1/2 cup of sugar in an electric mixer with the paddle attachment at medium-high speed until it is pale and fluffy. Add the vanilla extract. Combine flour and salt and add to mixer at once the stir with wooden spoon or spatula for a couple of turns. Return to stand and mix on low speed until just incorporated. Refrigerate until very firm, at least 2 hours. Preheat the oven to 400 degrees. Line a large baking sheet with parchment paper or nonstick liner. Roll the dough 1/8 inch and return to the refrigerator for an additional 15 minutes. Cut into desired shapes. Bake them for about 14 minutes, until lightly golden. 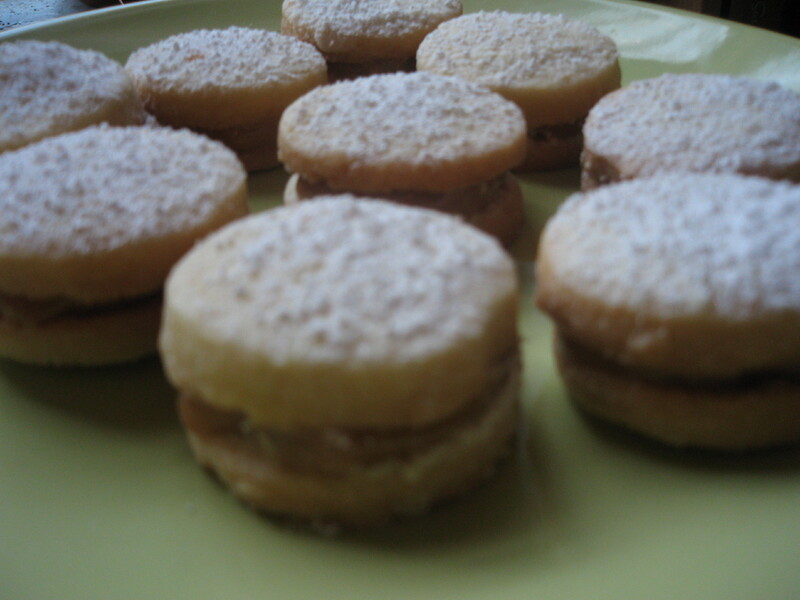 When they are cool, fill them with one teaspoon of dulce de leche filling and sandwich with another cookie. Sprinkle with powdered sugar. my mouth is watering!!! tell me… how were they. dont spare a single detail. yum. When I’d filled polvorones with dulce de leche before the butter in the cookie dominated the filling. Because the dulce de leche was richer this time and the cookies thinner, more like toffee, it held it’s own – a butter-caramel-shortbread. These look delicious! So glad the homemade version worked for you–yum. Thanks for the link and keep on cooking! I’m obsessed with alfajores and finding this recipe was such a nice surprise. Can’t wait to make them.